Most freshers’ ‘gateway drug’ into the infamous Wellington caffeine culture. 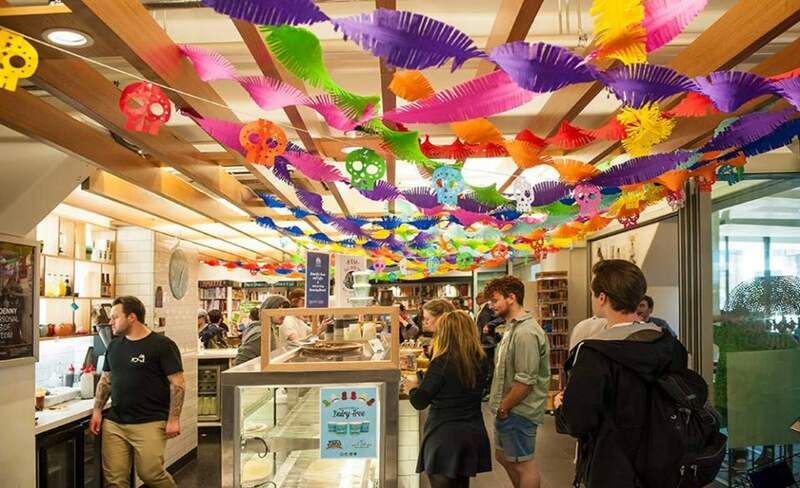 Vic Books is pretty much a freshers' 'gateway drug' into the infamous Wellington caffeine culture. Situated halfway up Kelburn Parade in a street-front campus building, it really rates for coffee, food and atmosphere. It's a combination perfected for busy students rushing to and from classes (their hourly line bulges are proof of this) as well as catering to anyone happening to stroll in from the street. The precision with which they handle the hordes and the speed at which you'll get your scone is pretty admirable really. The food selection is well on point- cabinets stuffed with salads. Scones. Pastries. Granola. Toasties at every turn. They've got delish gourmet pie flavours. There's a dish of the day the chef dreams up. They are seriously great at their vegetarian, gluten free, dairy free options. They even do waffles on Saturdays (all the more reason to trek to the library at the promise of brunch, amiright?). Being a Victoria student, Vic Books and I are intimately acquainted. There's not much I wouldn't order- the salads are well worth your time, as are the pies- try the beef ragu or the pumpkin spinach. The scones are perfect with a coffee halfway through a three hour workshop, and the post-all-nighter, post-assignment-hand in bowl of granola at 3pm (spearheading the #breakfastfoodsallday movement) is well worth your time. In terms of the caffeine, the Coffee Supreme hopper is always full of beans, the baristas always busy. Needless to say, it's got coffee down to a fine (and fast) art. They also have an expansive range of teas and cold drinks. Of note is their spectacular lemon honey and ginger (real ginger slivers, all I'm going to say. No syrups round here). If you're not going to spend your student loan on lunch, then you definitely will on books. A top-notch bookstore wraps itself around the café operation providing you with reading material while you perch there waiting for your name to be called.